We recently invited you to put your Twitter questions to our regular blogger and Golf Academy Instructor, Blair. Hi Blair, I’m a six handicap player but short off the tee. Any tips to improve separation and increase clubhead speed? To get big speed, the sequence of your downswing must be correct. Try pausing at top of your backswing and concentrate downswing on hips, chest, arms then club – in that order. Is there any point in packing a lob wedge for my round on the Old Course later this year? Definitely. 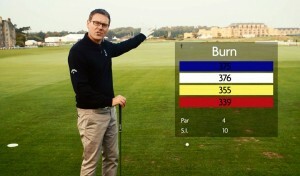 Using the bounce angle of the club effectively makes the shot easier when playing from a firm links surface. The angle of attack must be shallow – no divot. I have an out-to-in swing which results in a nasty slice with my driver. Are there any drills I can do to work on it? We’ve got a perfect drill for you to help improve this issue – read it here. Any advice on how I can keep the flight of the ball lower in windy conditions? We must keep backspin off the golf ball. Club up and swing slow. Move the ball back in your stance and lean shaft towards target. What’s the best fitness advice for amateur golfers? It’s all about flexibility. Gluteus, hamstrings and back muscles are key to good posture which is key to good golf. Try stretching exercises focused on these areas. Blair, how can I stop pushing shots to the right? The clubface is king. If the flight of the ball starts off right of target, then the clubface MUST be open. Work on squaring the clubface at impact. Who’s your tip to win The Open in July on the Old Course? Myself and the guys at the Golf Academy like the look of Ricky Fowler. He’s a great ball striker and has an impressive Open record already in his career. The instructors at St Andrews Links Golf Academy pride themselves on excellence and consistent delivery of coaching of the highest standard. Instructors are fully trained in the most advanced coaching techniques, ranging from the traditional approach to the highly technical. To book a lesson or for more information visit our website or email academy@standrews.com.